Released on: October 10th, 2018. The late Bernie Wrightson’s final project would, sadly, remain unfinished – at least by his hand. 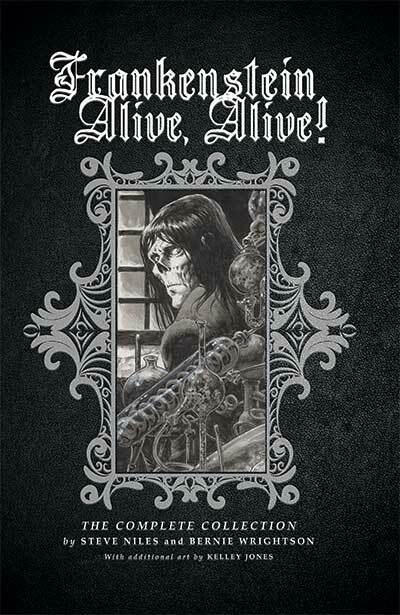 He and author Steve Niles set out to complete a four-issue mini-series entitled Frankenstein, Alive, Alive! but Wrightson would get sick, cancer, and pass away in March of 2017 leaving the work unfinished. IDW Publishing, who had been behind the project from the get-go, approached artist Kelley Jones to complete the work. This was, as Niles puts it in his touching intro, Bernie’s ‘contingency plan.’ He knew he was ill and that he might not be able to complete it and Jones, whose work was so clearly influenced by Wrightson’s, would be the perfect fill-in. 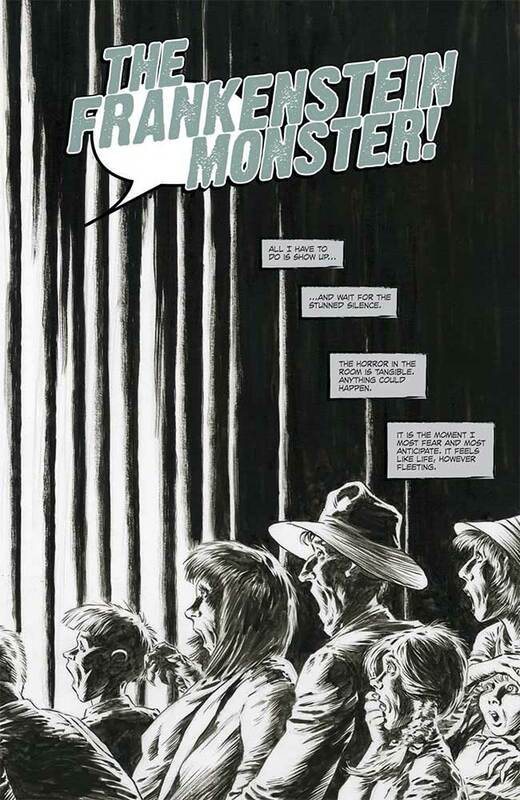 As such, Jones, working off of Wrightson’s layouts, was able to finish the book and, at the same time, pay tribute to someone who was clearly quite taken with all that Wrightson was able to bring to the table in terms of illustration. As to the story? This was, again according to Niles, Wrightson’s baby. Niles might be credited as writer but it was Bernie who came up with the idea of creating a comic book that would detail the exploits of the Frankenstein monster that took place after the events chronicled in Mary Shelley’s modern Prometheus. 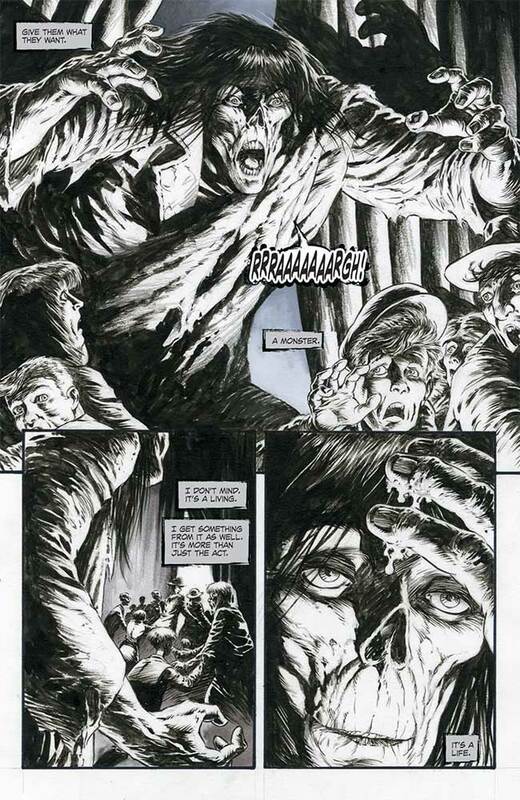 If you’ve seen the illustrated version of Shelley’s original Frankenstein that Wrightson was responsible for, you know it was a story that he loved – the amount of detail and passion in every single one of those illustrations speaks volumes and as great as the text is (and it really is a classic for a reason), reading Shelley’s words with Bernie’s art accompanying it really is the best way to enjoy the story. Without going overboard on the plot synopsis, the story follows the ‘monster’ as he looks back on the events of his past before then relaying his, unsuccessful, attempts to end his own life. Eventually he meets one Doctor Simon Ingles, a wealthy man with a massive library that he lays down at the creature’s disposal – but of course, there’s an ulterior motive here. As the creature attempts to discover what’s left of his humanity, we realize how his own narcissism exposes his flaws and, as he attempts to come to terms with the repercussions of his own actions, ultimately his own breakdown. 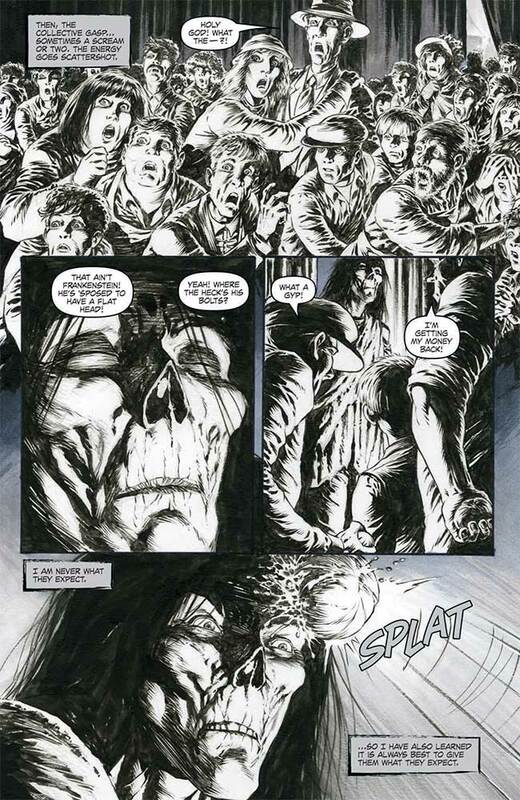 Wrightson and Niles collaborated on a few projects towards the end of Bernie’s career – Dead She Said, The Ghoul and Doc Macabre – but it’s this one that really stands out. Not to take away from those other works, they’re all quite entertaining and very much worth your time, but Frankenstein, Alive, Alive! takes what these two men were able to do and brings it to the next level. Niles’ prose is, in a word, eloquent. It doesn’t rip off Shelley’s work but it definitely continues the story in the same vein, which makes a lot of sense given how this story plays out and the different directions that it explores. The themes that Shelley dove into in her book first published in 1818 when she was just twenty years old, are exploited very effectively here. Niles makes sure that we feel for the monster, but at the same time, ensures that we’re oh so very aware of his own flaws and the problems that his hubris can cause. There’s a lot of depth to Niles’ writing, and if Shelley never got around to writing a sequel to her masterpiece, this is a very worthy successor from a literary standpoint. Of course, there’s also the art. Wrightson took his time with this project and, as such, there’s a load of detail to take in. If this doesn’t quite reach the sublime heights of his adaptation of Frankenstein (that thing took him seven years to complete and that was when he was in good health) it’s still miles above the vast majority of comic book work on the market then and now. 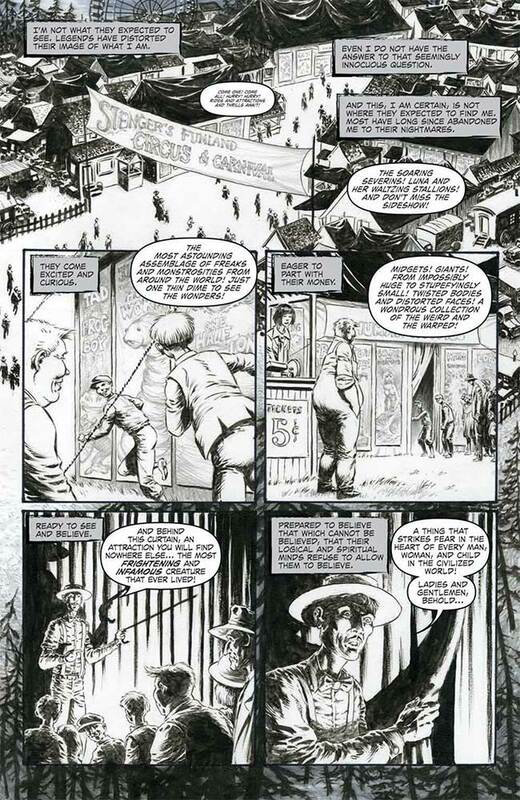 When the individual issues were published, the artwork was scanned in color from the original pages. This gives the material a genuinely unique look, and allows the reader to take in all of the detail not just on the inked material but in the pencils underneath is as well. The art is at its best when Wrightson is bringing the creature into the action. He portrays the monster with a gaunt face, looking almost like a zombie but not quite, but allowing a very human sense of expression to come through in the eye movements, particularly in the close up ‘shots’ that pepper the book. Double page spreads, such as the one that depicts the monster out in the snow in the first issue, add plenty of drama to the proceedings as do the follow up pages wherein he walks, soaking wet, through the cobblestone streets of the village undercover of night. And then there are, of course, Kelley Jones’ contributions to the project. Brought in at Wrightson’s request, it’s clear that his art is his own but at the same time, done entirely in the tradition of the material that came before it. Jones also goes way in-depth with his pencils, delivering some beautifully gothic-horror inspired work that finishes the project with style and class. The line work is gorgeous and the heavy inks bring an appropriately palpable darkness to the story’s finale. IDW’s ‘Complete Collection’ edition of Frankenstein Alive, Alive! brings together all four of the issues over which the story was told as well as some interesting extra features. We’ve already covered Niles’ touching introduction but in addition to that we also get a Bernie Wrightson Frankenstein Alive, Alive! gallery section. Here we get a selection of never before published layouts, thumbnails and pencil sketches that showcase the amount of detail and care that went into the man’s process. Some of these are accompanied by text on the right hand side of the page while some are presented simply as illustrations but for any fan of Wrightson’s work, this is a joy to behold if for no other reason than it gives us a look at how he thought things out. There’s nineteen-pages of material here, a good amount, all of which is worth digging into. And before it all ends, there’s a final page at the back of the book that commemorates the life of comicdom’s ‘Master Of The Macabre’ with a touching inscription and a beautiful illustrated piece by the man himself. All in all, a gorgeous piece of work that follows up a classic of horror literature with the style and maturity befitting of its predecessor. Wrightson’s work here is some of the best from the later part of his career, while Niles’ prose matches the art every step of the way. IDW’s presentation is top-notch and the inclusion of the unseen rough material adds even more to the package. Fans of Bernie Wrightson, Steve Niles or just quality horror comics in general should consider this essential. 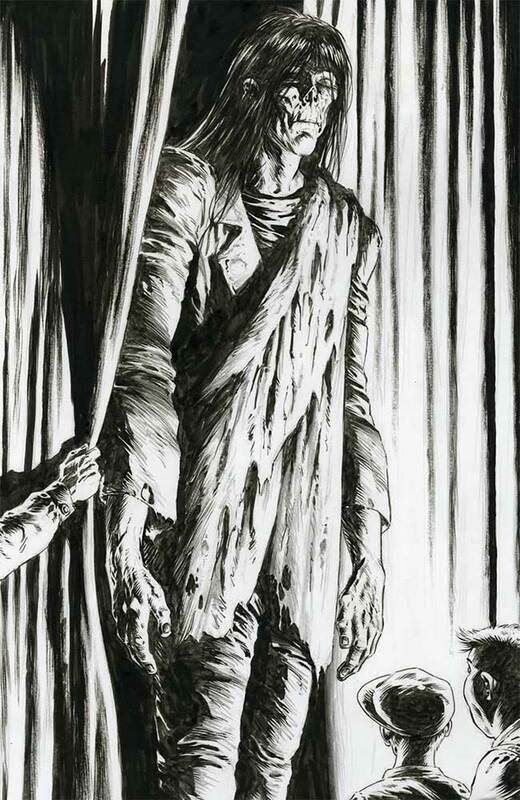 There’s nothing quite like the soulful quality of Wrightson’s art. I have never seen someone draw a monster with such sympathetic eyes.